Drosophila Schneider (S2) cells are an increasingly popular system for the discovery and functional analysis of genes. Our goal is to describe some of the microscopic techniques that make S2 cells such an increasingly important experimental system. Buster, D. W., Nye, J., Klebba, J. E., Rogers, G. C. Preparation of Drosophila S2 cells for Light Microscopy. J. Vis. Exp. (40), e1982, doi:10.3791/1982 (2010). The ideal experimental system would be cheap and easy to maintain, amenable to a variety of techniques, and would be supported by an extensive literature and genome sequence database. Cultured Drosophila S2 cells, the product of disassociated 20-24 hour old embryos1, possess all these properties. Consequently, S2 cells are extremely well-suited for the analysis of cellular processes, including the discovery of the genes encoding the molecular components of the process or mechanism of interest. The features of S2 cells that are most responsible for their utility are the ease with which they are maintained, their exquisite sensitivity to double-stranded (ds)RNA-mediated interference (RNAi), and their tractability to fluorescence microscopy as either live or fixed cells. S2 cells can be grown in a variety of media, including a number of inexpensive, commercially-available, fully-defined, serum-free media2. In addition, they grow optimally and quickly at 21-24°C and can be cultured in a variety of containers. Unlike mammalian cells, S2 cells do not require a regulated atmosphere, but instead do well with normal air and can even be maintained in sealed flasks. Complementing the ease of RNAi in S2 cells is the ability to readily analyze experimentally-induced phenotypes by phase or fluorescence microscopy of fixed or live cells. S2 cells grow in culture as a single monolayer but do not display contact inhibition. Instead, cells tend to grow in colonies in dense cultures. At low density, S2 cultures grown on glass or tissue culture-treated plastic are round and loosely-attached. However, the cytology of S2 cells can be greatly improved by inducing them to flatten extensively by briefly culturing them on a surface coated with the lectin, concanavalin A (ConA)3. S2 cells can also be stably transfected with fluorescently-tagged markers to label structures or organelles of interest in live or fixed cells. Therefore, the usual scenario for the microscopic analysis of cells is this: first, S2 cells (which can possess transgenes to express tagged markers) are treated by RNAi to eliminate a target protein(s). RNAi treatment time can be adjusted to allow for differences in protein turn-over kinetics and to minimize cell trauma/death if the target protein is important for viability. Next, the treated cells are transferred to a dish containing a coverslip pre-coated with conA to induce cells to spread and tightly adhere to the glass. Finally, cells are imaged with the researcher's choice of microscopy modes. S2 cells are particularly good for studies requiring extended visualization of live cells since these cells stay healthy at room temperature and normal atmosphere. Schneider S2 cells were derived from trypsinized late embryos of Oregon R Drosophila. Schneider's original culture consisted of a mixture of cell types but became more homogeneous with continued passage1. They have been described as being macrophage-like (they are phagocytic) with hemocyte-like gene expression. S2 cells can be obtained from the ATCC, DGRC, or Invitrogen. A number of media have been used to culture S2 cells. None of the media mentioned below require a 5% CO2 atmosphere. Schneider originally used her defined medium (Schneider's Drosophila medium) supplemented with 10% heat-inactivated fetal bovine serum (FBS). While FBS makes this medium more expensive than the serum-free media mentioned below, it has relatively low autofluorescence and so is a good choice for epifluorescence microscopy of live cells. However, it does contain sufficient metal to stimulate a low level of expression of those transgenes under control of the inducible metallothionein promoter (e.g., genes subcloned into Invitrogen's pMT vector), causing "leaky" expression of the gene before induction. Several serum-free media are commercially available (e.g., Sf900 II, HyClone SFX-Insect, and Insect-Xpress). These media are relatively inexpensive but usually stimulate higher levels of expression when using metallothionein promoter-regulated transgenes as compared to Schneider's medium. Furthermore, these media produce significant autofluorescence compared to Schneiders' medium/FBS (an important consideration when performing live cell fluorescence microscopy). Optionally, antibiotics can be added to the medium; these are usually penicillin G and streptomycin sulfate (50-100 units/mL and 50-100 μg/mL final concentrations, respectively). Also, the anti-fungal reagent, amphotericin B, can be added to 250 ng/mL (final concentration). S2 cells are easily maintained under normal lab temperature and atmosphere conditions. When imaging live S2 cells for extended times, the primary causes of cell death are dehydration and photo-toxicity. Dehydration is easily prevented by keeping sufficient medium in the dish on the microscope. Photo-toxicity is a trickier problem that requires minimizing the cells' cumulative exposure to high-intensity, high-energy light while imaging frequently enough to capture interesting events with adequate spatial and temporal resolution. S2 cells growing on tissue culture plastic are generally rounded and loosely adherent. Confluent cells grow as a dense monolayer and then, increasingly, more cells will lift off and grow in suspension. For microscopy of both fixed and live cells, the imaging is greatly improved if the cells are induced to flatten onto the cover slip. This trick is described below (2. A. 2.). We use inverted microscopes to visualize live S2 cells plated on glass-bottom dishes. The glass-bottom dishes described below will keep the cells in a condition very similar to their normal culturing condition, and also allows live cells to be examined through microscopy-grade glass. This is the glue to attach the cover slips to the dishes. The kit has a two parts, the resin base component and the curing agent, that are mixed at a 10:1 (resin : curing agent) weight ratio just before use. Weigh out roughly 5 g of the resin into a plastic weigh boat. Note the weight of the resin. Calculate how much curing agent is needed by multiplying the resin weight by 0.1. Add this amount of curing agent to the same weigh boat using a new transfer pipet. Stir to thoroughly mix the components. Don't worry about the bubbles that appear; they will slowly disappear. The glue is now ready. It has a honey-like consistency and will be usable for at least an hour. 5.5 g of glue is enough to make roughly 75 dishes, but this depends on how stingy you are when you apply the glue. We do not use cell culture grade dishes because we are only interested in having cells attach to the glass bottom (and not the plastic) -- so instead we use cheaper, standard Petri dishes. Some microscope stages have circular clamps to hold 35mm dishes; if you have this, be sure that your dishes will fit the clamp. Surprisingly, not all 35mm dishes have the same outer diameter. Choose cover slips appropriate to your microscope and needs. Anything from expensive specialty glass with photo-etched grids (e.g., Electron Microscopy Sciences, 23x23 mm circular, gridded, no. 2, cat. no. 72264-23) to much cheaper bulk cover glass (e.g., VWR, 22x22 mm square glass, no. 1.5, cat. no. 48366-227) could be used. Caution: The glass must be slightly larger (at least about 1mm) than the hole that you will make in the Petri dish, and must also be smaller than the diameter of the dish. If you intend to buy square glass, be sure that the glass will completely cover (and extend a little beyond) the circular hole, but won't reach the sides of the dish. If you prefer to clean your cover glass, do so before gluing them to the dishes. We use a hand drill with variable speed and a lock-on button for continuous use. Drilling dishes is much easier with a drill press, but small scale production of glass-bottom dishes doesn't justify the purchase of a drill press. Use a ¾ inch spade drill bit (a spade bit is pictured on this webpage: http://en.wikipedia.org/wiki/Drill_bit). Of course, the diameter of the bit determines the diameter of the hole in the bottom of the dish. Use a conically-shaped grinding bit with a coarse grit and a diameter about the same as the spade bit. After all the holes have been drilled, use this bit to bur away plastic fragments at the edge of the hole that project from the bottom of the dish. Plastic fragments on the outside face of the dish will prevent the cover glass from sitting flush against the dish. Don't worry about small plastic pieces sticking up into the dish's interior: they won't affect the cover glass or the cells. This is used as the drilling surface. Cover one outer side of the Styrofoam box with strips of sealing tape (we use 1.5 inch Scotch sealing tape); the sealing tape minimizes the escape of bits of Styrofoam while drilling. Place the bottom half of a 35mm Petri dish on the Styrofoam box's taped surface; place the dish so that's its bottom side is against the Styrofoam box. While holding the sides of the dish firmly, drill a hole through the dish. Caution: Your fingers holding the dish will be a fraction of an inch from a rotating drill bit. Naturally, this is dangerous. Stop drilling if the dish begins to spin. If you have a drill press and/or a clever way to hold the dish firmly, use them. We have never had an accident, but do whatever you need to make this procedure safe. After drilling all of your dishes, smooth the outside rim of the holes using the grinding drill bit. We place the power drill on its side, with the bit projecting out over the edge of the counter. The drill is held in place by placing something heavy but pliable on it (we use a heavy duty plastic bag containing 10kg of sand). Use the lock-on button to keep the drill continuously running, and then smooth the rims of all your dishes by holding each dish and moving it against the grinding bit to smooth away the rough edge of the new hole. Put all the dish bottoms in a large beaker and rinse them several times with distilled water to remove the small, loose pieces of plastic or Styrofoam (which will float). Afterwards, lay the dish bottoms out to dry. When the dishes are dry, prepare your Sylgard 184 glue. Apply a small circle of glue around the drilled hole on the outside surface of each dish. Not much glue is needed; in fact, too much glue will make a mess. Place a cover glass over the hole, in contact with the glue. The cover glass should sit against the dish smoothly and evenly. If the glue wasn't perfectly distributed around the hole, then there might be small gaps where glue is missing between the cover glass and dish bottom. Initially don't worry about these gaps; usually the glue will creep into these gaps to fill them. After gluing on all of the cover glass, go back and check the dishes for gaps that haven't been closed by glue. At any gap, apply a small dab of glue to the edge of the cover glass near the gap; the glue will wick into the gap. Set the dishes aside, bottom side up, to dry. This can take a day or more at room temperature, but you can increase the curing rate by putting the dishes in a warm incubator. If you need sterile dishes, put the dish bottoms and lids in a tissue culture hood and spread them out. Don't put the lids on the dish bottoms. Instead, turn the pieces so that their inner surfaces are directly facing the UV bulb. Turn on the sterilizing UV light for at least 45 min. If you plan to ConA coat the dishes (see below), do not sterilize the dishes until after they are coated. The dishes are now ready for use. The lectin, concanavalin A (ConA), was found to stimulate S2 cells to flatten against a surface coated with ConA3. When S2 cells are seeded onto cover slips coated with ConA, they spread and become excellent specimens for microscopy. To ConA coat plain cover slips, spread the cleaned cover slips on top of a piece of Parafilm taped down to a bench top. Place 10 μLs of a 0.5 mg/mL solution of ConA (in sterile water) on the surface of each cover slip, and then spread the material over the entire top of the cover slip. After drying, store the cover slips in a clean, dry container. The coated glass can be sterilized with the UV light in a tissue culture hood. To ConA coat glass-bottom dishes, similarly spread 10 μLs of the ConA solution onto the upper side (i.e., lid-facing side) of the glass. After drying, the dishes can be sterilized as described above. ConA-coated dishes or coverslips are stored at room temperature and can be used months after preparation. Gently resuspend the RNAi-treated S2 cells and transfer them to a ConA-coated, glass-bottom dish containing 2 mLs of medium. Healthy cells that contact the ConA-coated cover slip will adhere tightly to it and begin to spread. This process should become apparent by about 15 min, and should be complete by 45 min to 1 hr. Note that attached cells cannot perform cytokinesis due to their tight attachment to the ConA-coated surface and will become polyploid over time. Cells seeded into ConA-coated dishes will remain healthy for extended periods, but will not proliferate in these dishes. After cells have attached, the medium can be exchanged if the old medium is autofluorescent. This may not be necessary for studies using confocal or deconvolution microscopes or wide-field microscopes with small depths-of-field objectives. Since S2 cells are healthy at room temperature / normal atmosphere, then no special conditions or equipment are needed when the cells are on the microscope. We often take long time-lapse movies of live S2 cells. In practice, the runtime of these experiments is limited by the usual problems of photobleaching and phototoxicity. Glass-bottom dishes vs. plain cover slips: Either of these can be used when fixing cells. When using plain cover slips, place a single ConA-coated cover slip into an individual 35mm dish (which does not need to be tissue culture grade), add 2 mLs of media, and then transfer the RNAi-treated cells into the dish. After cells have attached to the cover slip, remove the medium, briefly wash the cells with an appropriate buffer (PBS works well), and add the fixative (see below) to the dish. Afterwards, the cover slip can be removed from the dish and processed further, for example, by immunostaining. Fixation: A variety of methods have been used to fix S2 cells. The best fixation method will be determined by how well a fixative preserves features of interest, without destroying or losing epitopes or tagged proteins. Some procedures require an extraction step before fixation in order to expose the epitopes of some proteins located in dense or compact structures. Since the S2 cell literature is fairly extensive, it is usually possible to find a published method to optimally fix your S2 cell structure of interest. Methanol is a common fixative. The methanol should be cold (at least -20°C) and anhydrous (molecular sieves [type 3A] can be added to the methanol to abstract water). We chill about 300 mLs of anhydrous methanol in a covered 1L glass beaker in an explosion-proof 20°C freezer. When the methanol is cold, remove it from the freezer, quickly remove the medium from the glass-bottom dish (or dish containing a cover slip), and then rapidly plunge the dish down into the methanol and leave it there. The beaker of methanol usually holds about a dozen dishes. Work quickly and return the beaker (containing the dishes) to the freezer as soon as possible. Fixation is complete in 10-15 min. Afterwards, remove the dishes from the beaker, pour out any methanol remaining in them, and rehydrate them by adding PBS / 0.1% Triton X-100. They are now ready for standard staining procedures. Formaldehyde is another common fixative. We use 10% formaldehyde in buffer (PBS is acceptable, but use the buffer most appropriate to your needs). We use this relatively high concentration of formaldehyde because S2 cells lack cytoplasmic intermediate filaments which would otherwise help maintain cell morphology and organization during the fixation process. Pour off the fixative into a waste beaker and wash the fixed cells with three brief washes of PBST (PBS + 0.1% TritonX-100). Next, add 1ml of blocking solution to the cells for 15 minutes. We routinely use 5% normal goat serum in PBST. Pour off the blocking solution and add primary antibody (diluted in blocking solution) directly onto the cells. 100 μl of antibody solution should completely cover the cells. Place the Petri lid back on dish to prevent evaporation of the antibody solution. Let the antibody incubate with the cells for 30 minutes at room temperature. Remove the antibody solution and perform three PBST washes. Use a transfer pipet to add 2 ml of PBST to the dish. Wait 5 minutes between each wash (no need to swirl the dish). Pour off the last wash and add 100 μl of secondary antibody (diluted in blocking solution) directly onto the cells. Place the Petri lid back on dish to prevent evaporation of the antibody solution. Let the antibody incubate with the cells for 30 minutes at room temperature. Remove the secondary antibody and perform three 5 minute washes with PBST. After dumping the last wash, add a few drops of your mounting media of choice directly onto the cells. We use 0.1 M propyl gallate dissolved into a solution of glycerol:PBS (9:1) and stored at 20°C. Replace the Petri lid and store the dish in dark environment. As with any experimental system, there are limitations to the use of S2 cells. First, cultured S2 cells typically exhibit a low mitotic index (approximately 1% in serum-free media), whereas the mitotic indices for many transformed mammalian cell lines are as much as 10 fold higher. Therefore, for studies of mitotic phenotypes, S2 cell cultures require a longer search to find appropriately-staged cells. Second, for cell cycle studies, drug treatments are very effective at arresting S2 cells during specific cell cycle phases. However, compounds that have reversible cell-cycle arresting effects in cultured mammalian cells do not easily washout in S2 cells. Thus, protocols for synchronizing proliferating S2 cells have not been established. Third, S2 cells are not migratory nor do they display epithelial characteristics. The biggest selling point for S2 cells is their utility as a model system. They are particularly useful for assessing the cellular functions of your protein of interest: S2 cells are treated by RNAi using dsRNA that is easily (and relatively cheaply) synthesized in the lab, and they serve well for live cell analysis and for immunofluorescence of fixed cells. In addition, a key benefit to S2 cells is the ease with which they can be maintained in the lab, using relatively inexpensive serum-free medium and no tissue culture incubator. A typical experiment would involve plating S2 cells in an appropriate tissue culture container (say, a 6 or 96 well plate), adding home-made dsRNA to the wells, and then maintaining the cultures as the targeted proteins are gradually depleted by RNAi. Depending on the target proteins being depleted, the cells may show a morphological and/or behavioral change as a result of target protein knock-down. The time required to reduce target protein expression to a minimum is specific to the protein and should be determined by Western blotting. Normally S2 cells do not adhere tightly to plastic or glass, and this would pose a problem for experiments requiring the microscopic examination of treated cells. However, S2 cells can be induced to flatten extensively by simply plating them on a surface coated with the lectin, concanavalin A (ConA). Within an hour of plating on ConA, most cells have lost their rounded appearance as a result of spreading extensively on the ConA surface (Figure 1). The cells are now ready for further processing (e.g., by fixation and immunostaining) or microscopic observation of live cells. S2 cells can also be transfected (using a variety of chemical reagents or electroporation) to either transiently express an exogenous gene or to stably incorporate the gene into the genome (thus creating a cell line that maintains the exogenous gene through repeated divisions). Transfections can serve many purposes, like expression of fluorescently tagged proteins that mark structures of interest in fixed or live cells (Figure 2), or that are used as bait in in vivo pull-down or immunoprecipitation experiments, etc. The method of analysis depends, of course, on the biological question being addressed by the experiment. A common method of analysis of RNAi-treated S2 cells is immunofluorescence of fixed cells (Figure 3). For example, immunofluorescence is typically used with genome-wide screens of Drosophila gene libraries to rapidly identify proteins with interesting activities in vivo. The analysis can be made more elaborate by simultaneously depleting multiple target proteins in S2 cells in order to examine the potential functional interactions between the target proteins. And the analysis can be extended to live cells, to observe the effect of RNAi on dynamic processes. Again, S2 cells are particularly well-suited for this type of analysis because they can plated on ConA-coated glass-bottom dishes and visualized for many hours on an inverted microscope without the need of an environmental chamber. Figure 1. 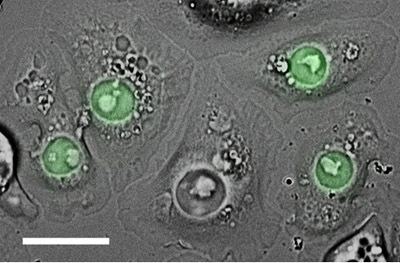 Phase contrast images (20x magnification) of S2 cells after plating on a concanavalin A-coated glass-bottom dish. The numbers indicate the minutes after plating. Note that the cells become phase dark as they flatten on the coated cover slip. Cell flattening is apparent by 15 min (arrows) and is essentially complete by 60 min. Right panel: Magnified image of attached cells; their extended and flattened margins are clearly visible (arrowhead). Scale bar (for the four left panels), 20 μm. Figure 2. S2 cells transiently transfected with a fusion construct consisting of nucleophosmin (a marker for the nucleus) fused to the fluorophore, eGFP (green). These cells were plated on a ConA-coated glass-bottomed dish, and then imaged with DIC and epifluorescence. Scale bar, 15 μm. Figure 3. Fixed S2 cells immunostained for PLP (green; a centriole marker), microtubules (red), and Hoechst-stained (blue) for chromosomes. 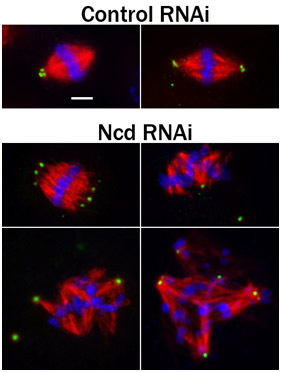 Before fixation and immunostaining, the cells were subjected to a 4-day treatment with either control RNAi or RNAi to knock-down Ncd, a kinesin-like protein that promotes spindle pole "focusing"4. Note the splayed spindle poles and disorganized spindles in the cells treated with Ncd RNAi. Scale bar, 2.5 μm. For the cell biology field, an ideal system would be inexpensive to maintain, easy to manipulate, and amenable to a variety of techniques. Drosophila S2 cells satisfy these requirements, and so they have rapidly become the system of choice for a growing number of cell biology labs. We have presented a brief overview of the methods to prepare S2 cells for microscopy. A notable virtue of S2 cells is the fact that they grow well in normal atmosphere and room temperature; therefore, they can left on the microscope for extended periods without any special maintenance requirements. 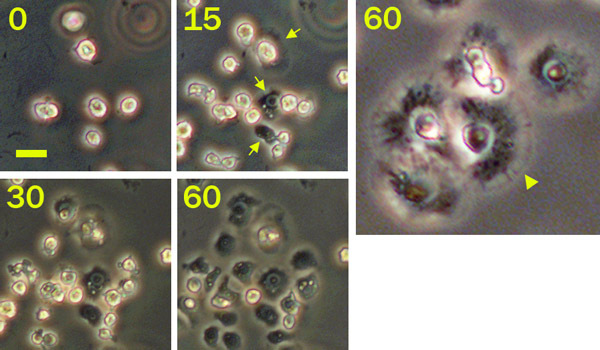 Even though they are generally somewhat rounded and loosely adherent under normal culturing conditions, S2 cells can be induced to extensively flatten for imaging. S2 cells cultured on glass-bottom dishes that have been pre-coated with concanavalin A will attach and spread thinly on the cover slip, making them excellent microscopy specimens. This work was supported in part by the National Cancer Institute P30 CA23074, the American Cancer Society Institutional Research Grant 74-001-31, and the Univ. of Arizona GI SPORE (NCI/NIH CA9506O). Schneider’s S2 medium Invitrogen 11720-034 Add 10% (final) heat-inactivated FBS to make complete medium. Schneider, I. Cell lines derived from late embryonic stages of Drosophila melanogaster. J Embryol Exp Morphol. 27, 353-365 (1972). Rogers, S. L., Rogers, G. C. Culture of Drosophila S2 cells and their use for RNAi-mediated loss-of-function studies and immunofluorescence microscopy. Nat Protoc. 3, 606-611 (2008). Rogers, S. L., Rogers, G. C., Sharp, D. J., Vale, R. D. Drosophila EB1 is important for proper assembly, dynamics, and positioning of the mitotic spindle. J Cell Biol. 158, 873-884 (2002). Goshima, G. Genes required for mitotic spindle assembly in Drosophila S2 cells. Science. 316, 417-421 (2007).